Enjoy bug-free evenings outdoors with the LED Bug Trap. Simply plug the unit into any 110v outlet and the 6 LEDs produce UV light that attracts insects. Once in range, the bugs are sucked inside by the vacuum where they are captured in the removable collection net. 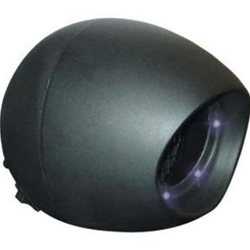 Product Feature Whisper-quiet Vacuum Fan. Attracts Insects with UV Light. Removable Collection Net. Safe and Effective.